We finally got a couple of doses of winter, and so my hiking activities have been limited. I’m glad for it; we’ve had a very dry winter so far, which makes for a very bad fire season come early summer. And I’ve taken the opportunity to do some work around the house. Part of the inspiration for that is that we had one of our bathrooms remodeled. There was a fair amount of water damage around the tub, meaning, more expense and time, but it’s finally done and the bathroom is wonderful. 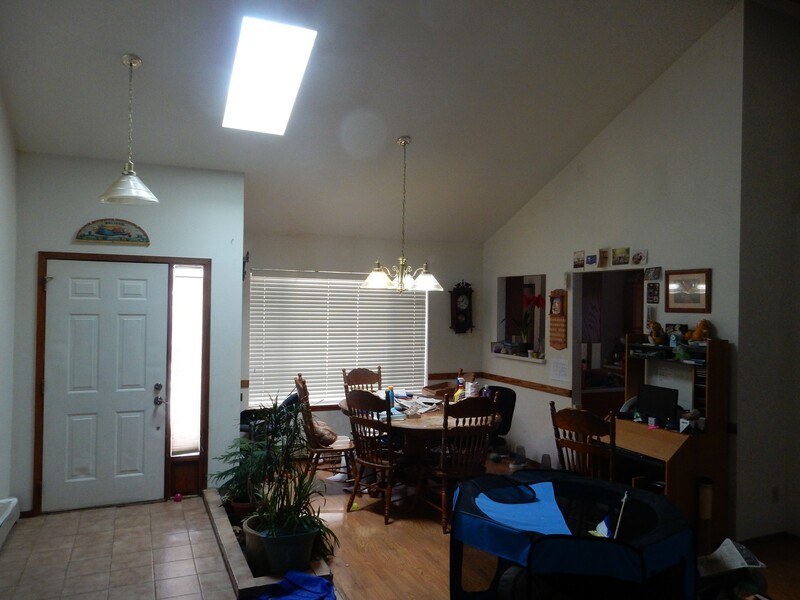 In fact, it makes the rest of the house look bad. We’ll do the other bathrooms when we’re replenished our savings, but, in the meanwhile, I’ve started repainting the interior, one wall at a time. Two weekends ago, it was the south wall of the living room. Last week it was the east wall. This was a little tricker, because it included the stairwell. I ended up having to buy an edger and an extender for my paint roller. 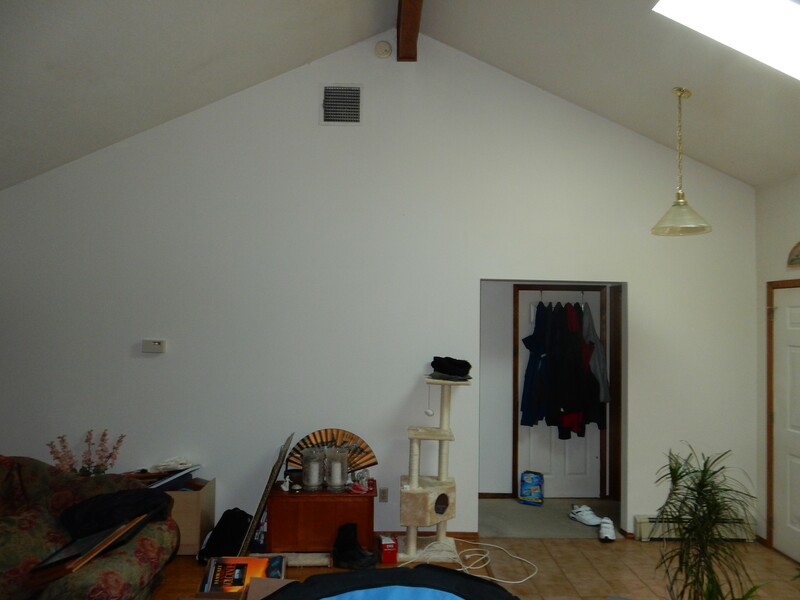 Also, this section included some wall and ceiling that had been badly damaged by water before we got the roof replaced a year or so ago, so there was some scraping and patching. This was much harder. 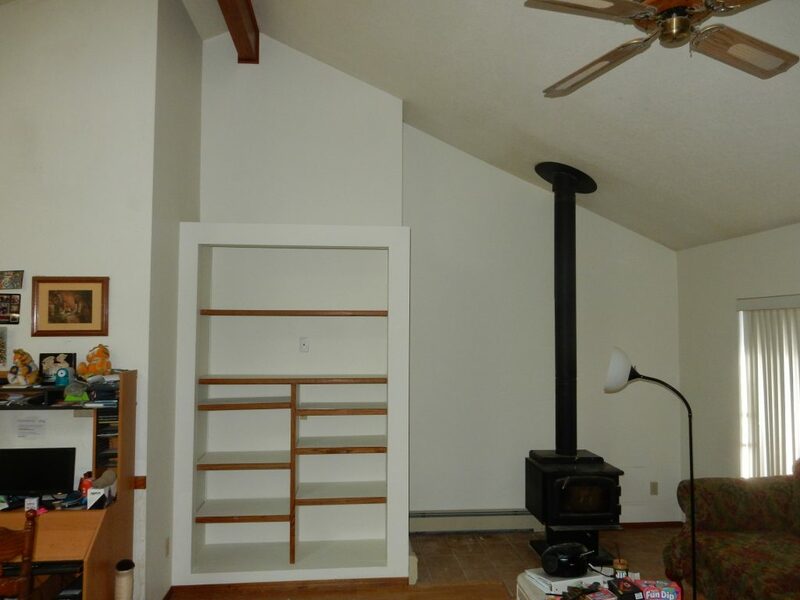 The stove can’t be moved, of course, and there was stuff stacked around it and on the build-in bookshelves to move. Plus pulling the shelves themselves out for cleaning and painting. I’m using a color closely matched to what we had before. Cindy likes the color; but there was fifteen years’ of kid’s greasy fingerprints and such on the walls and they needed a fresh coat badly. The only real change is switching from a pure flat interior to eggshell, which has just the barest hint of gloss. There was also some candle wax on the book shelves, and a couple of oily spots on the wall (dunno from what.) So my routine is to scrub the wall down with some trisodium phosphate solution (great degreaser and all-around cleaner, and not particularly toxic, if rather alkaline). Then rinse down the wall with clean water. Mask the floorboards and baseboard heaters. Remove candle wax with a scraper, get the last traces by putting a paper towel on the waxy spot and running a hot iron over it. Bottom line: Four hours of prep, followed by two hours of actual painting, followed by 40 minutes of cleaning up. And it feels like every muscle in my body hurts this morning. The shoulders and knees are particularly bad, and there’s a spot above my right derrière that is really sore from all the bending. So today I rest up. Next week will be the west wall. It should be much easier. I’m not doing the ceiling. That’s the threshold where I call in a professional painter. Anyway, the ceiling is not yet so bad as to need painting. After the living room, I do the hallway (after patching a couple of dings in the plaster), then as much of the downstairs as I get at. The trouble downstairs is that this is where my library, fish tank, and computer desk are. None is easily moved. I may be able to get behind the fish tank with extender tools, which is good, given that it’s a massive 55-gallon tank with some rainbow fish and clown loaches still inhabiting it, and moving it is really problematic. The bookshelves and computer desk are not really problematic, just a lot of work; I may hire some young flunkies to help me move them. New roof. New baths. Painting. Does this foreshadow anything? … Yes, Cindy is anxious to move to Rio Rancho as soon as the boys finish high school, so we can be closer to competent medical care for our kids. 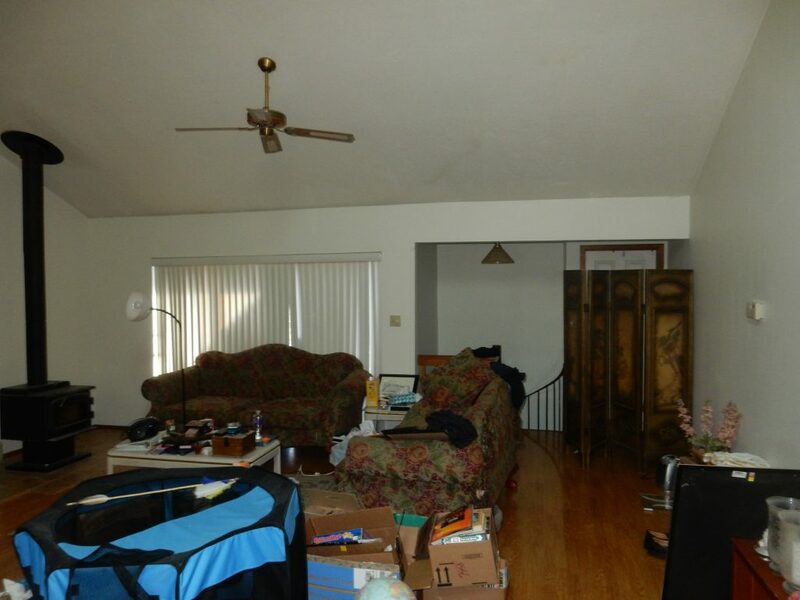 So the house needs to be in some kind of condition to sell, because we wont’ be able to afford to move if we can’t get some serious equity out of the house. It’ll be a long commute to LANL for me, but Rio Rancho is likely a temporary move. Cindy wants to retire to Preston, Arizona, when the time comes. Which may not be long; I was pretty good about putting money away when I first started pulling a professional salary after finishing graduate school, and we’re in reasonable shape for retirement. Perhaps in as little as five years. That assumes there isn’t some dramatic change in tax law or the economy between now and then. It also assumes we can find some work to pay the bills; I won’t be old enough to actually draw retirement at that time. So, really, semi-retirement. No. I’m not really counting on Social Security when I make my retirement calculations. You may have noticed this in the last photo. 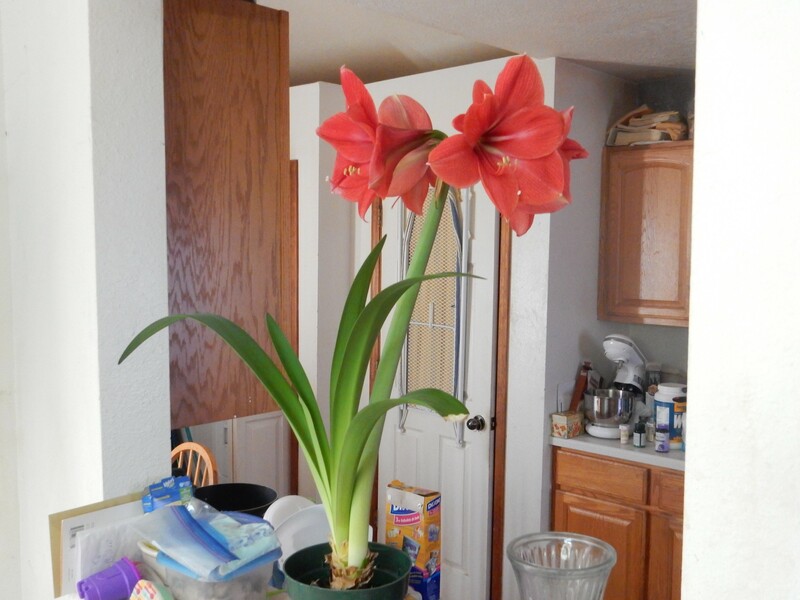 I’ve had this enthusiastically blooming amaryllis for a couple of years now. I summer it by the front door, and this year it seemed to do particularly well. Oddly enough, though, I forgot it on one of our first really frigid nights, and feared I’d frozen the bulb. Evidently not. In fact, this may have been an “at once, sir” event, from the point of view of the amaryllis, because I’ve never gotten four blooms out of a summered amaryllis before. Spring is showing outside as well. 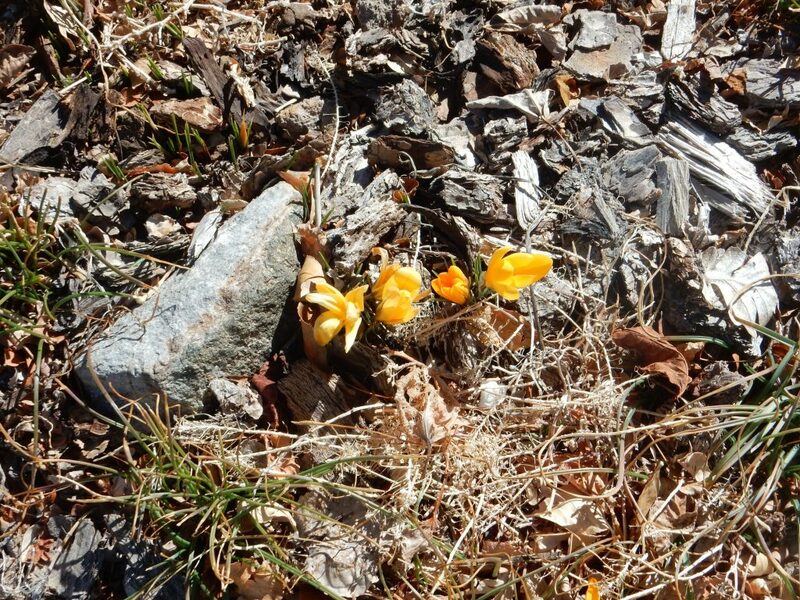 In fact, the crocuses have been up for a couple of weeks now, and the daffodils are now coming up. I normally love the approach of spring, but this year, I could hope for a couple more doses of winter before spring comes for real. We really need more snow pack. I have not entirely skipped hiking; I need the walking exercise for my diabetes. However, the closest I’ve come to an adventure is trying a different branch of the Potrillo Canyon trail network. I took just a few pictures, mostly ones I might possibly use for the book. Here’s Potrillo Wash, a typical dry stream bed of this area. Extensive beds of El Cajete pumice. Or, at least, I think so. This location is just above the Cerros del Rio basalt flows and it might be Guaje Pumice. Okay, let’s unpack that. The Cerros del Rio Formation erupted around 3 million years ago, and makes up both the basalt plateau southeast of the Rio Grande, across from White Rock, and the basalt under much of White Rock itself. My house is built on Cerros del Rio basalt (“the wise man built his house upon the rock…”). 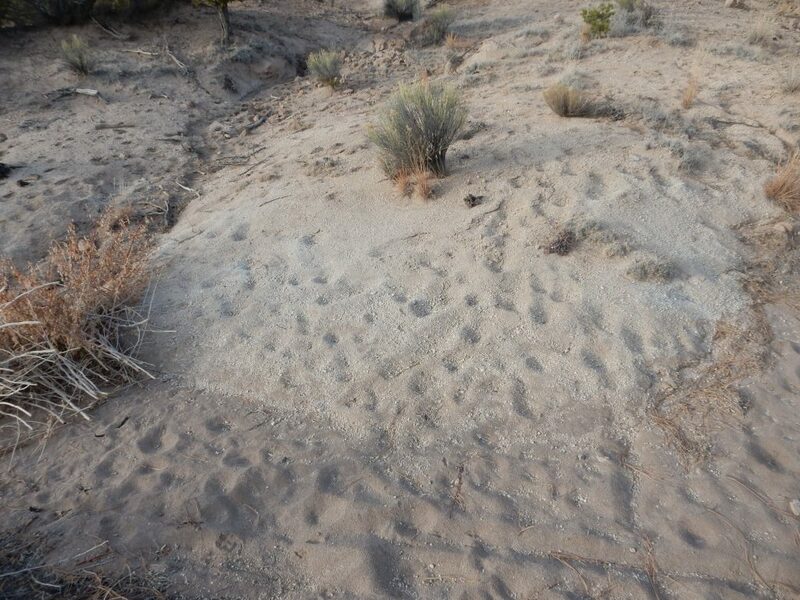 About 1.62 million years ago, the Toledo event blanketed this area, first with air-fall beds of the Guaje Pumice, then with pyroclastic flows of the Otowi Member of the Bandelier Tuff. The Valles event 1.25 million years ago put down a second blanket of air-fall pumice (Tsankawi Pumice) followed by pyroclastic flows (Tsherige Member, Bandelier Tuff). The pink mesas around White Rock are mostly Tsherige Member; the Tsankawi Member is very thin here. Otowi Member pyroclastic flows did not reach the White Rock area, because this was an area of high ground at the time. However, some Guaje Pumice might have reached the area, since it was air fall not constrained by topography, and if so, it would be found at the base of the pink mesas just above the black basalt. El Cajete Pumice is geologically very young, emitted by a vent south of Redondo Peak just 55,000 years ago or so. 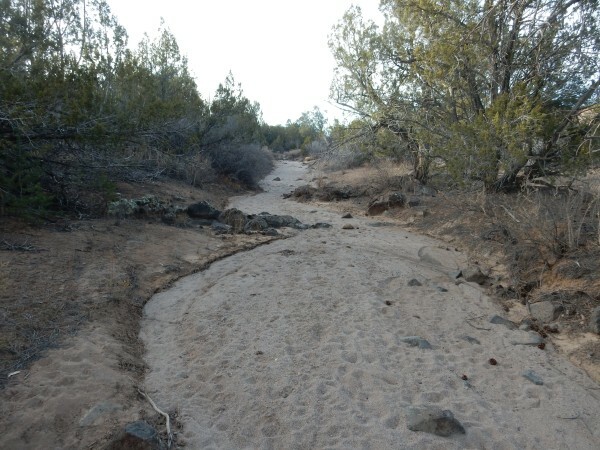 It blanketed much of the southern Jemez and across the Bandelier area clear to the Cerros del Rio, but not much is thought to have reached as far north as White Rock. So maybe this isn’t one for the book until I can identify which pumice this was: Guaje Pumice or El Cajete. The distinction is that Guaje Pumice is pure white with some grains of quartz and feldspar in it, while El Cajete is distinctly off-white and has visible grains of biotite (black mica) in it. I didn’t look at any of this pumice closely enough to tell. 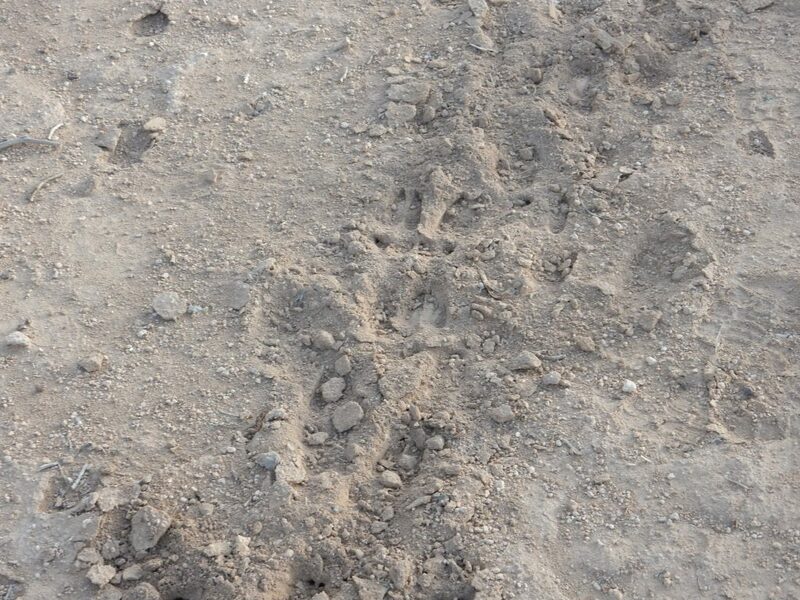 Well, the trail is very close to my home; I’ll likely have another chance. The elk like to move down to our area in winter. Not many years ago, I was out walking Laci (the Wonder Dachshund) and discovered there was a large herd just across State Road 4 from my house. The bulls were standing guard around the rest of the herd, with only a flimsy barbed wire fence between me and them. Fortunately Laci did not notice them; like most dachshunds, she is utterly unaware of her own smallness, and if she had started barking at them and spooked the bulls, it might have gotten unpleasant. Laci is not doing well. She’s 13 now, an old doggie, and her eyes are in awful shape. The right eye was clouded up completely, which I attributed to cataracts, but now is sinister bloodshot red. She seems to see a little out of the other eye, still, but a few days back she was awfully confused. Seems a lot more like her old self now. But I fear the dread day is fast approaching when I will be taking her to the vet for a trip she won’t return from. I don’t want to close on that unhappy note. So here’s a finally cheery panorama of the confluence of Potrillo Canyon and Water Canyon. I am planning the 27th Annual Kent is No Longer 29 hike on the last Friday of March. As usual, I’ll put out an invitation to any family or friend interested in joining me. I’ve not settled on a final venue yet, but am leaning either towards taking the Ancho Springs Trail into White Rock Canyon or the Sagebrush Flats Trail to the northern Cerros del Rio. Neither is really suitable for solo hiking so it’d be nice to have a couple of hiking partners. I might take a serious hike in two weeks, but likely the next big wanderlust will be the birthday one.